There are well over 6000 people in the ‘new jungle’ now, numbers have more than doubled in just over a month. 6000 is the government’s estimate, and is almost certainly a gross underestimate. Some volunteers who are on the ground daily. distributing humanitarian aid. reckon there may be well over 7000 people, maybe more than 8000 even, nobody knows exactly how many, it is impossible to count. New people keep arriving every day and in numbers. The biggest influx is of Kurdish from Kirkuk (Northern Iraq), that was the safest part of Iraq, but now everybody is fleeing ISIS. Very numerous are the families with young children and babies. I spoke to a man who was a peshmerga: his brother was killed in combat, after that he has been too traumatized to keep fighting. Most of the families are Kurdish but there are others, from Syria including a father with a disabled child, he was hoping that in England the boy can be cured; from Afghanistan including a family with 6 children, the oldest a teenager the youngest a baby; Iraqi Arabs, Iranians including three lone fathers with very young children whose mothers have died or have disappeared. There are Black children in the camp but not many, most of the little Africans stay in the Jules-Ferry centre with their mothers, but there are no facilities for single fathers and families who do not want to be separated. So hundreds of children and women sleep out in the jungle. When I first saw all these kids I had to go away because I wanted to cry: I have seen children and babies in the jungle before, but never that many! Later I returned with a drum, a guitar and some other instruments, the kids loved it and started playing. Some Kurdish grownups had a sound system and started to dance, a toddler was teaching a baby how to do the Kurdish dance and it was so lovely and funny. The recent creation inside Jules-Ferry of 200 more places for women and children in heated tents. where they have no privacy, has done nothing for families who do not want to be separated, nor for single fathers. Luckily a team of volunteers mostly from Ireland built many small houses in what is now the family camp in the jungle. There is a lovely kitchen nearby providing free meals, hot drinks, music and good vibes. Next to the family camp a new Protestant church, not beautiful like the famous Orthodox church, just a green tent for the moment, offers some protection to the Eritrean and Ethiopian women who are camping in the church’s precincts – most sleep in small houses with other single women or with their husbands, all lovely people. Places in the Jules-Ferry centre are never sufficient, and sometimes women are asked to leave because they have been there longer than three months, or they have been absent for more than 24 hours – they get counted and controlled 3 times per day, or they fall foul of the discipline somehow. For women who arrive alone, especially at night, the jungle is a very dangerous place, sexual assaults are very common. I personally have no evidence of women being forced into prostitution, but I know for a fact prostitution is widespread, that is, they are forced into prostitution by extreme poverty and there is no protection whatsoever for women and children other than that offered by their husbands, fathers, brothers and communities. Even if they sleep inside the Jules-Ferry centre, any time they go out they are in the jungle! Women are forced into unhealthy relationships with men who do not love them and often abuse them, especially when they are drunk: they have to take a boyfriend to avoid the attention of all other men. With the cold coming conditions are hardening, children are falling sick. There are also fights and tensions in the family camp, some Kurdish are saying the camp is for Kurdish – despite being thought as international by its creators; two Afghan families have moved out to try get some peace. The fastest growing slum in Europe gets bigger and bigger, the bigger it gets the more crowded it gets, the dirtier it gets, the place gives me the creeps and makes my stomach churn. No safety, no hygiene, not enough shelter, not enough food, not enough water points or rubbish collections. The University of Birmingham published a study and they found E-coli in the drinking water over acceptable limits, but we are walking in a sea of raw sewage, every time you take off yours shoes you touch them with your hands, children touch everything and put their hands in their mouths, and diarrhoea is widespread, not surprisingly. So are scabies, lice and there have been quite a few cases of TB. The shanty town is build on a former dump and near to two factories classed Seveso. 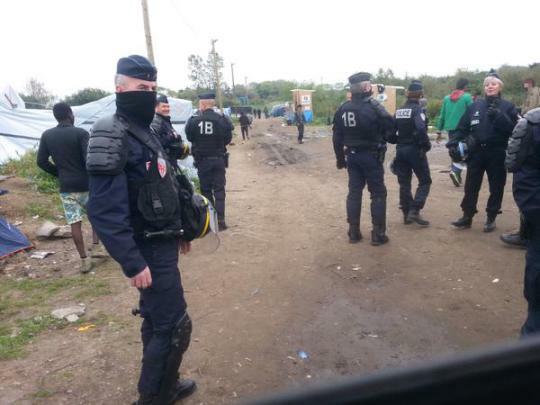 The the two charities Medicins du Monde and Secours Catholique took the French government to court over the unacceptable conditions in the camp, and the verdict will be delivered next Monday. The charities are asking for the new jungle to be closed down, and all people re-housed in empty buildings to be requisitioned for that use. In the meantime, they are asking for 25 extra water points, as 6 are not enough for over 6000 people. Health care is insufficient and collapsing – cazeneuve has promised ONE more doctor and one psychologist, for all those people! They are asking for more toilets, showers, rubbish collections and more food, one meal per day for 2500 people is all the Jules-Ferry centre provides at the moment, people queue 3 hours for that only meal, and if people are not starving it is only because international volunteers feed them. But, in order to harass also the volunteers and render distributions more difficult, the police are now blocking access to all vehicles, except for the few associations who are allowed to work in the Jules-Ferry centre. This abusive restriction is also being legally challenged. It looks like an attempt to hinder humanitarian aid and separate people in the jungle from their supporters. Police presence in the camp is massive and very intimidating, and since the last visit of the minister of interior cazeneuve more police have been drafted to Calais for a total of over 1000. They are surrounding the jungle and they are particularly active on the motorway and Eurostar. Mass arrests have began since the minister’s visit, mainly of people trying to cross. People are deported from Marck airport by private jet, pretty much daily now, to detention centres all over France, in a futile attempt to empty the jungle. 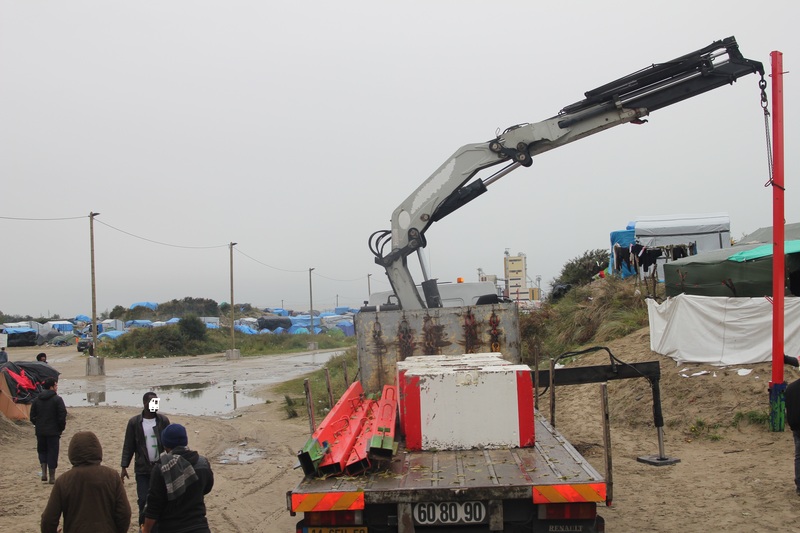 Usually they are released by the judges after a few days because these procedures of arrest and dispersal are illegal, and make their way back to Calais: of course they are not given any money or any train ticket, so it may take a few days, and a few nights sleeping out with nothing. In the meantime families are separated, and the most vulnerable left to fend for themselves. A husband contacts the association who does legal support in the detention centre, not for himself but because he is desperate to let his wife and two children know where he is. A young man has been separated from his 12 years old brother, who has been left on his own, does not have a phone and does not know anyone in the jungle. Another brother is desperately worried for his sister, who is 15 and alone in the jungle. Every day local volunteers and associations get many calls to help finding family members who have been separated. A more effective and less cruel way to empty the jungle is to give accommodation to people who asked for asylum in France: 300 and then 400 asylum seekers for a total of 700 have been moved this week to accommodation centres around France, in ex-summer holiday camps etc. Most are Sudanese but there are also Eritreans, Afghans and others. Though I am very happy they are out of that hell, I am concerned that France has a very high rate of refusals of asylum claims, 74%, and numbers of refusals are increasing. Eritreans are usually accepted, Sudanese are often refused, more than half of them, and less than a quarter of the Afghans are accepted. Before, refused asylum seekers were mostly left in limbo, now they are looking for ways to deport them. The dream of cazeneuve is to bring numbers down from 6000 to 2000 – of course it is a dream because there are many more than 6000 already, new people keep coming and thousands of people are arriving in Greece and Italy daily, it is a flow that does not seem to stop. Imperialistic wars in the Middle East, Africa and Asia are creating the biggest refugee crisis since WW2, with over 60 millions of people displaced: the majority remain internally displaced, some 20 millions fled their countries, most are rotting in refugee camps in neighbouring countries, the bravest are risking their lives in dinghies and leaky boats just looking for a life – not a better life, they had a good life in their countries before their countries got destroyed and/or they had to flee for their lives. Calais makes school: there are jungles popping up everywhere now, and new fences, and organized institutional abandon of refugees fleeing the most terrible situations, governments absent except for building fences, hotspots and detention centres and sending police to stop and deport people; big NGOs absent or complicit; volunteers trying their best to provide the bare essentials and often they can not, people end up gong hungry and sleeping out in the rain with their children on the Greek islands and all the way through the Balkan route. Plans to empty the Calais jungle are being implemented for real: it is not going to work, but it is going to cause more unnecessary suffering. Of course, suffering has been used as a deterrent against refugees since 2002, when the camp at Sangatte, run by the Red Cross. was closed down to deter people from going to England, and people had to go self-catering, in squats and woods they ironically named jungles. Police were employed to brutalize people, gas them, beat them, destroy their shelters, papers, family photos, arrest them again and again for no reason,just to make their life so miserable that they eventually leave Calais. I fear all this is now starting again on a much larger scale, and in a place that has been chosen by the police for being out of town and out of sight – it was cazeneueve’s plan, the government told people to go in the wilderness where they will be ‘tolerated’ – but are not going to be tolerated for much longer. According to the creep cazeneuve, Calais “does not have the vocation to host so many people” – but no solutions have been offered except to those who renounce their plans to go to England and apply for asylum in France. 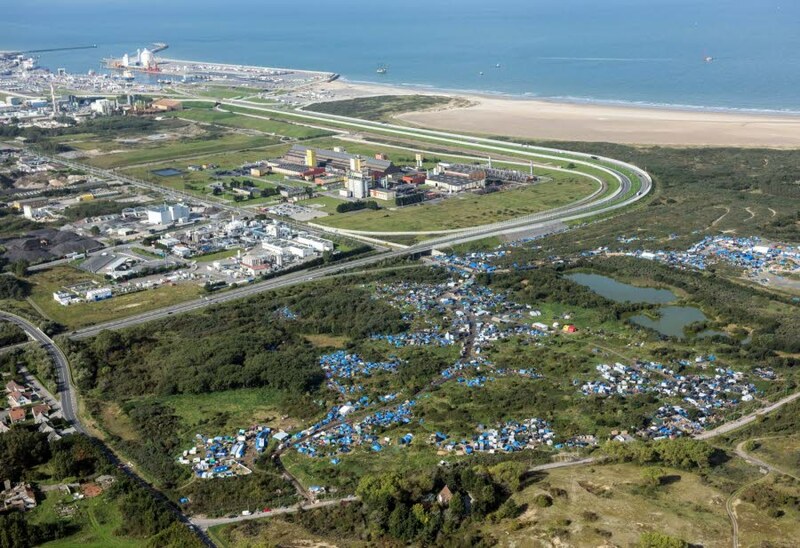 Three centres for orientation are to be opened in the future but outside Calais, where people will be pressurized to apply for asylum in France. 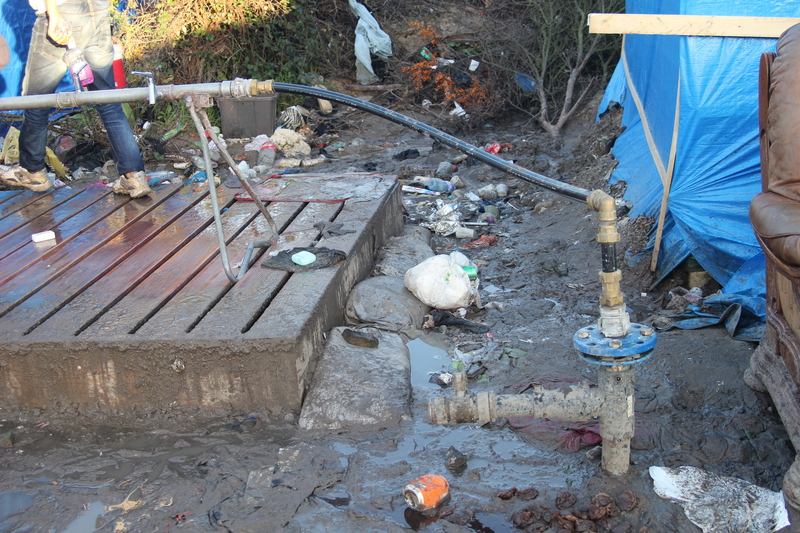 A camp is to be build in Calais, in the worst part of the jungle that floods every time it rains. 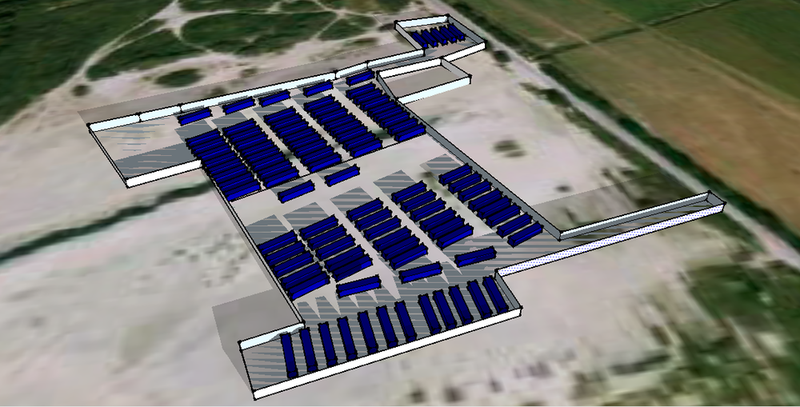 1.500 people will be allowed to sleep there in containers. It is not clear what the new camp is going to be, but it is clear it is not going to be nice, in the map it looks like an internment camp of the thirties. Works are to begin on Monday and red metal pools have been put in place already, suggesting the new camp will be surrounded by a tall fence. 400 people who are already living there are to be evicted. Everybody who has some experience of Calais seems to think that evictions could continue after that. 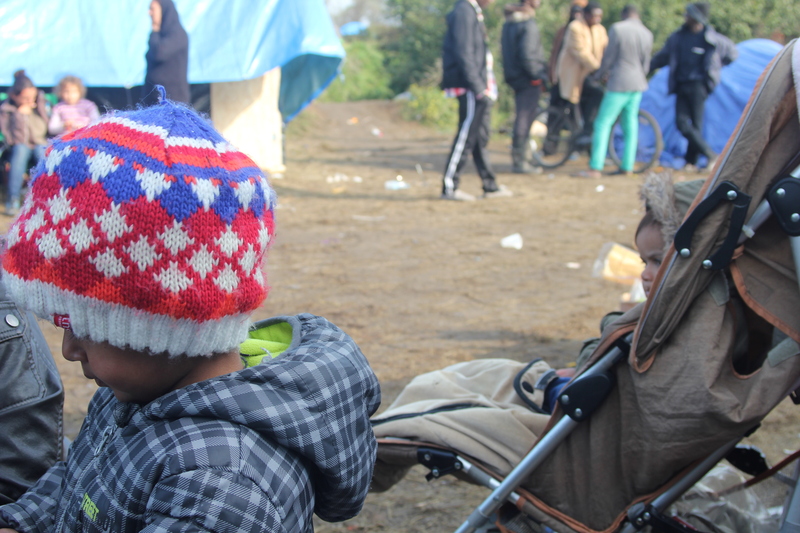 300 women and children are allowed to sleep inside Jules-Ferry for up to three months. Some asylum seekers have been or will be given accommodation. What will happen to all the others? I therefore appeal to the international solidarity movement to become more political: it is not enough to provide humanitarian aid; it is great, it is vitally important, but it is not enough, and a different effort is needed if we want to shelter and protect our brothers and sisters. We must oppose, by all means necessary, government policies that attack, oppress and dehumanize refugees and other migrants. We must defend the right to life and safety from inhumane and degrading treatment. We must defend the right to move. Questo articolo è stato pubblicato in Senza categoria il 31 ottobre 2015 da EXODUS - watchtheborders.